Up until this past Friday, it had been 17 days since I had really spent some time photographing my kids using my DSLR. I know that doesn’t sound like a long time, and sometimes it isn’t, but this time, it was too long. I was feeling disconnected, both from photography and, truth be told, my kids. I’ve been immersed in women’s leadership coaching and growing my business, and processing some different reactions to the things that are going on in the world right now too numerous to count or list. Friday they had the day off school, and the weather was beautiful, so we headed out into the city, camera in hand. It felt so good, as I knew it would, but sometimes it surprises me how much my own medicine works! I see photography as a women’s leadership tool when the act of looking at our life through the lens of our camera (and it doesn’t have to be a DSLR) can help us slow down, be present, connect with our kids, see the joy and beauty around us, and shift both our internal and external narratives around what our life is supposed to look like and what it is. Photography has the power to bring us into a state of acceptance - the ability to see things as they are is so important yet can be so hard when we are so committed to progress and change. But just as it is hard to figure out how to get to your destination on a map if you don’t know where you currently are, so is it true in life. Acceptance doesn’t mean we have to like it. If nothing else, this past year in the US has starkly revealed how much there is not to like. But being willing to look with eyes wide open at the dark side also enables us to see the bright spots more clearly - this is a critical component to leadership. 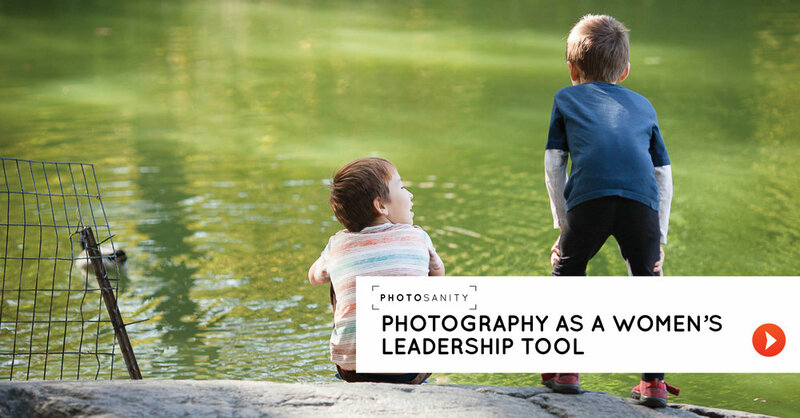 I have decided to take a three month break from creating new content for the Photosanity blog. I need some time to integrate all the pieces of the business, and I think that is best done offline... but don’t worry, I’m not going anywhere! I’ll still be posting weekly, highlighting past posts that have proven to be particularly resonant. I’ll also continue to post new content on social media - follow me on Instagram for new photos, or friend me on Facebook (just drop me a note if I don’t know who you are). And, I will also be posting new content - I have decided to start a Patreon page to write about diversity, inclusion, and race in particular. Firstly, I had created a Medium account where I thought I would post, but I discovered that I am not willing at this time to write completely publicly on these issues. Secondly, my Facebook posts on these topics have received a great response, but it’s not a great platform for long-form content, or for accessing archives. Finally, I would like to get paid for this work. For those of you not familiar with Patreon, it is a content platform that allows creators to charge for access at various pricing tiers. I'm thinking of setting tiers in the $2-$20/month range. I’ll be officially launching on November 8th - it seems fitting for the date one year on from last year’s election. Stay tuned for more information. I hope you’ll join me there.